Klarus XT11S is an Upgraded 4th generation ultra-compact, lightweight, super-bright tactical flashlight with Superior performance protected by two original patents. 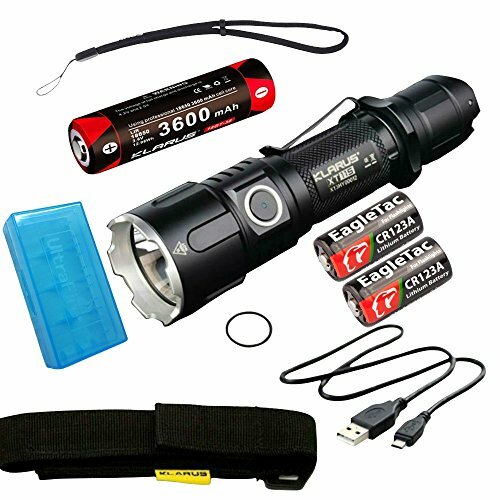 Powered by CREE XP-L HI V3 LED, delivering a maximum output of 1100 lumens, provides a strong spotlight with a maximum beam distance of up to 360 yd/330 m. Dual tactical tail switch as well as side switch are easy to operate and designed to satisfy any user requirements.This great Multi- purpose flashlight has clear, versatile functions: Straight 2 Strobe, Instant Turbo, Instant Low-light, Memorized Function ability, SOS, Side Switch Lock Function, Battery Capacity Indicator, USB Rechargeable, ITS Smart Temperature Control System, Easy Mode Change. Ultra compact and lightweight (head diameter 34.9mm, body diameter 25.4mm, length 139mm), net weight 115g (without battery). If you have any questions about this product by Klarus, contact us by completing and submitting the form below. If you are looking for a specif part number, please include it with your message.